The Replacement Rotary Lift Lug with Safety Lock has an additional safety feature to help prevent the lug from accidental dislodgement under unstable conditions (while not under load). It should be used in areas where it is not practical to have personnel standing by to insure that the 90° interlock of the toe in the corner fitting is maintained prior to lifting. PROOF TESTED to 2x WLL. Set of Four Required per container. 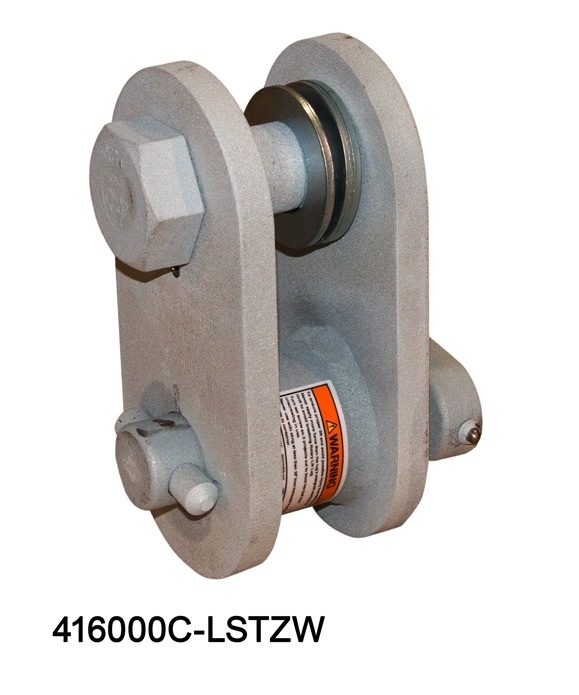 This lift lug fits to the side apertures of standard ISO 1161 corner fittings. It rotates to any angle of pull, however ISO 1496 does not permit 40' containers to be lifted from the bottom corners at an angle of less that 30 degrees to the horizontal plane. The lugs fit left hand or right hand corner fittings. They do not require shackles to connect to the sling. Each is proof tested and have zinc thermal spray finish. (Zinc thermal spray is a sprayed on coating of hot zinc and is similar to hot dipped galvanizing). It is simple to use. Just insert the "toe", twist 90° and lift. The roof wall of the corner fitting captures the toe and prevents fall out. The body of the assembly rotates around the toe. NOTE: SEE BELOW FOR ISO 3874 STANDARDS FOR PROPER LIFTING FROM THE BOTTOM OF A CONTAINER. 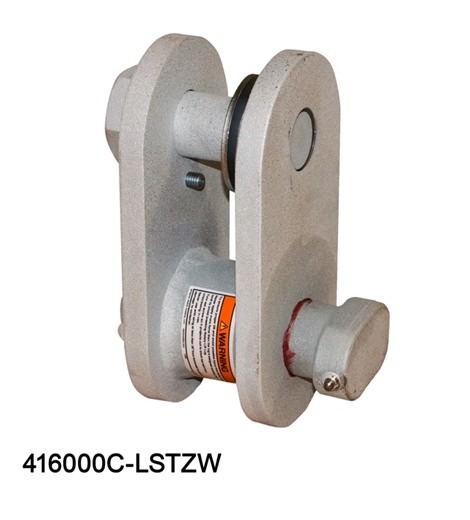 USE: Use the rotary lift lug to connect lifting slings to the bottom side apertures in ISO 668 type freight container corner fittings (ISO 1161). When toe of the lug is inserted into the aperture, it is rotated manually, using the crosspin, to a lock position 90° offset from its entry position. When the sling is lifted, the flat sides of the toe head bear up onto the internal "ceiling" wall of the corner fitting and are thus held in the lock position during the lift. Because the body of the rotary lug freely rotates about the toe head, the lift sling leg can assume any angle from between 30° to 90° from horizontal without changing the internal bearing of the toe head inside the corner. 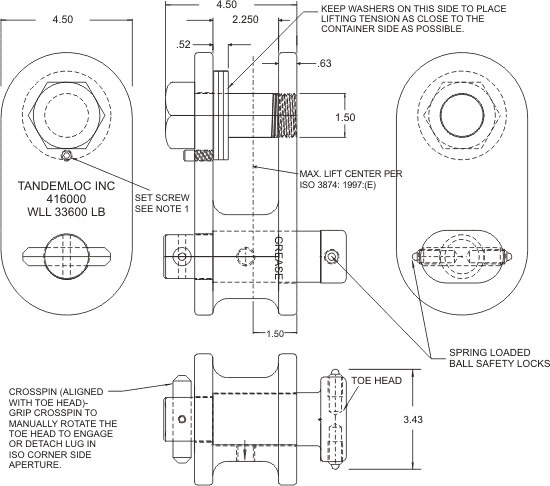 The - LSTZ assembly has an additional safety feature to help prevent the lug from accidental dislodgement, under unstable dynamic conditions, where it is not practical to have personnel standing by to insure that the 90° interlock of the toe in the corner fitting is maintained prior to the final lifting. 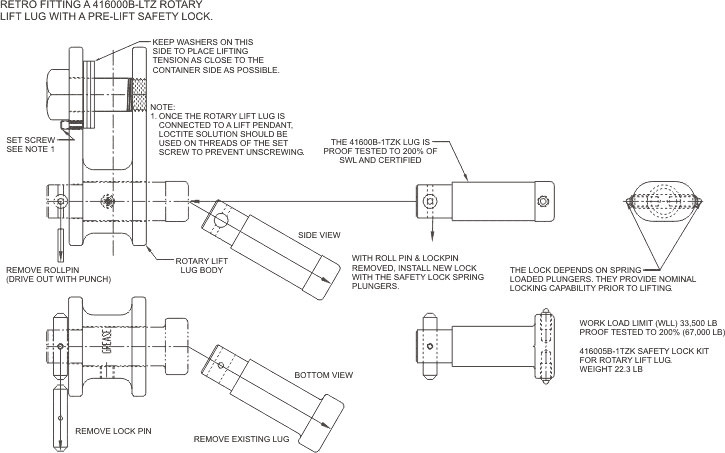 Once the rotary lift lug is connected to a lift pendant, a thread-locking solution should be used on threads of the PC 5 set screw to prevent unscrewing. To insert the safety assembly, align the toe head for entry into the aperture in the corner fitting. Tilt the body back slightly and lay the bottom plunger lock inside the aperture, depressing it as the body is tilted up against the side of the corner and allowing the top ball lock to enter the aperture. Push against the body & manually turn the toe from the opposite end, using the crosspin to grip and turn it. Since the crosspin is in the same plane as the toe head you will see when the 90° interlock is achieved. Once interlocked, the ball locks expand to resist dislodging. To remove, reverse the procedure. 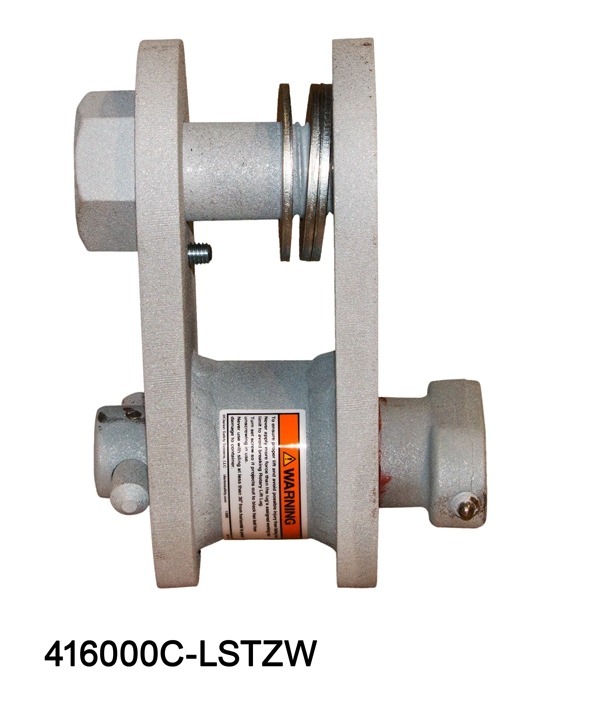 For use in temperatures from +20° F to +120° F.
The 416000-LSTZ except the body is welded instead of cast. 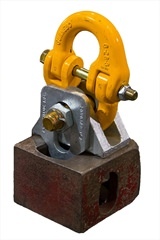 The upgraded safety assembly has an additional safety feature to help prevent the lug from accidentally dislodgement, under unstable dynamic conditions, where it is not practical to have personnel standing by to insure that the 90° interlock of the toe in the corner fitting is maintained prior to the final lifting. Lifting devices shall be properly engaged. NOTE - See footnotes in Table A. The applicability of bottom lift slings is given in Table A below. Folding platform-based containers (codes PL and PC; see ISO 6346), when empty and in the folded condition, may be handled in interlocked piles. The total mass of the pile shall not exceed the maximum gross mass (rating) according to ISO 668. For loaded containers, the lifting angle, a, shown in figure 1, shall not be less than the minimum values shown in Table A. 2 - Center of gravity may be mobile, e.g. liquid, bulk or hanging load.